Simon & Schuster, 9781476782348, 384pp. A fascinating and important work of ornithology, which led E.O. Wilson to call it "one of the most interesting discoveries I've seen in animal sociobiology in years," Ravens In Winter is a scientist's impassioned study to understand the mysterious social habits of one of nature's most formidable birds, the raven. Why do ravens, generally understood to be solitary creatures, share food between each other during winter? This was the question Bernd Heinrich asked himself as he was observing another one of his prime research subjects, the highly social bumblebee. And it was during these trips to Maine, the site of much of his research, where he first noticed this "unusual" behavior of ravens. From an evolutionary perspective, the raven's willingness to share food challenged conventional wisdom. There was no biological imperative, it seemed, to their communal spirit. The more Heinrich observed their habits, the more odd the bird's behavior became. 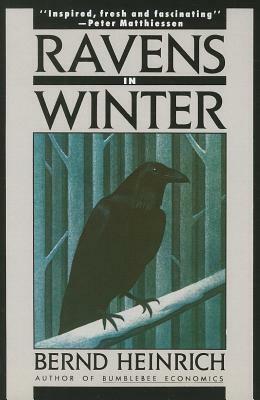 What started as mere curiosity turned into an impassioned research project, and Ravens In Winter, the first research of its kind, explores the fascinating biological puzzle of the raven's rather unconventional social habits.